Continuing with our theme of things inspired by the royal wedding, I asked Terry to keep this in mind when making suggestions for today. 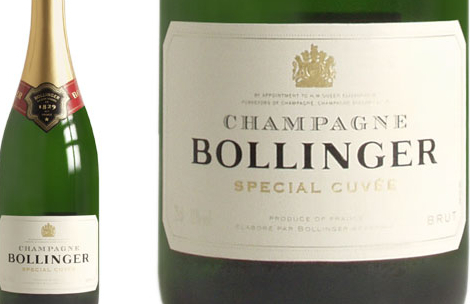 I was thrilled that she decided to include Bollinger as it was what we served at our wedding. So now Terry will join us to select some royal libations! Wine enthusiasts looking to mark the upcoming royal wedding with a bottle of fine champagne may wish to invest in Bollinger. The royals have a long-standing association with the Champagne estate, with Queen Victoria having issued a royal warrant to Bollinger in 1884. 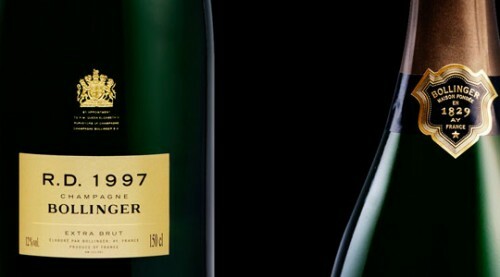 This made Bollinger the first official wine of the British Empire. It received another Royal Warrant in 1950 from King George VI, and the Queen Mother, HRH The Queen awarded her Royal Warrant to Lily Bollinger in 1955. Otherwise I never touch it, unless I’m thirsty. It remains the official champagne of the royal household. Prince Charles served it at the reception for his wedding to the late Princess Diana, and Wine Spectator expects it to be the bubbly of choice for William and Kate. After the Royal Wedding 600 guests will be served a breakfast that will include champagne and caviar just to name a few goodies. William and Kate have decided to stay in the traditional British fare for their meals. To mark the occasion, Bollinger is releasing a menu of royal wedding breakfast pairings, helping those who want to mark the special day with a bottle of Bollinger and complement it with the right cuisine. Pairing ideas include kedgeree or bubble and squeak (above) for something authentically British, or caviar and poached eggs for something more decadent. And Bollinger is no stranger to the silver screen, as it has been the champagne of choice for 007 James Bond ever since Ian Fleming wrote the first Bond books over fifty years ago. 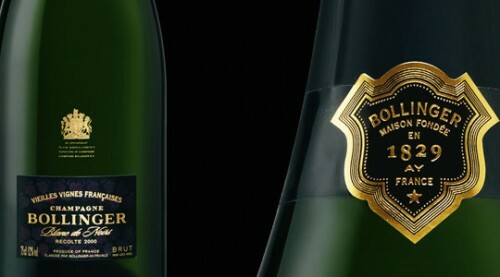 As with most champagnes, Bollinger has several offerings. 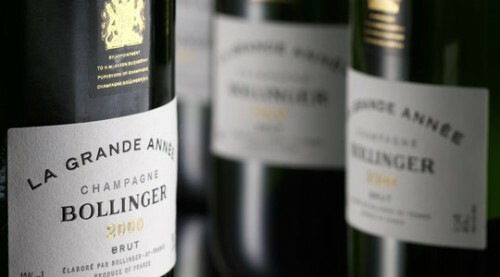 Vieille Vignes Françaises (vintage): The most prized Bollinger Champagne is that generally made from grapes of the ‘original’ Vieille Vignes Françaises (old french vines). These are the few surviving vines that have resisted the devastating phylloxera pest since its accidental introduction in the late 19th century from America (since then, most vines in Europe have been grafted on to American root stock naturally resistant to Phylloxera). Regarded as Bollinger’s prestige cuvee, this blanc de noirs is made in small quantity with wine from two small plots of ungrafted rootstock planted in low density (3000 vines per hectare). The total area of vines used for this rare champagne is less than half a hectare. The low-density vineyards, consisting of the aforementioned ‘old french vines’ are severely pruned, and thus produce 35% less juice per vine, creating a “super rich” wine. Two such priceless Vieille Vignes vineyards remain in Bollinger’s holding today, namely Clos St-Jacques and Clos des Chaudes Terres, both very close to Bollinger headquarters in the village of Ay. They are planted exclusively with Pinot Noir grape vines. 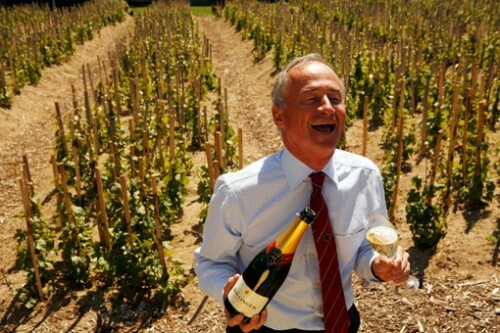 Here is Ghislain de Montgolfier, head of Bollinger, in a vineyard that survived the phylloxera blight. After the champagne breakfast, a formal dinner will follow later in the day that reporters seem to think will be a mix of modern and traditional English cooking. 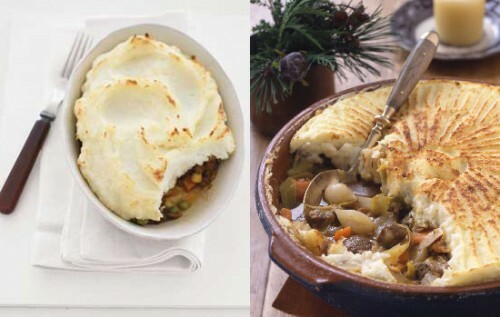 Many have speculated that William’s favorite childhood dish, cottage pie (similar to shepherd’s pie but made with ground beef rather than lamb) might make an appearance on the table. If I were to pair a perfect white and red wine for the Shepherd’s Pie to be served to the Royal family, the red would have to be a classic claret such as Ch. 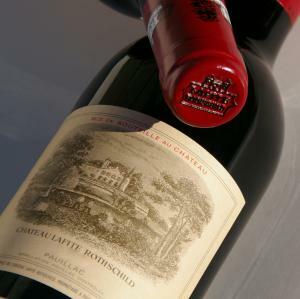 Lafite Rothschild 1982. The winemaker’s notes for this great vintage include dark ruby color, ripe black currants, violets and vanilla, spicy, oaky scents. The wine has great finesse and a particular softness imparted by the Merlot. It tends to be firm yet delicate and supple, with great elegance developing with age. 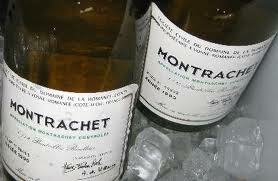 For the white I would use the best and classiest wine in the world which is the Domaine de la Romanee Conti Le Montrachet 1999, a wonderful vintage in Burgundy. The whole region of Burgundy is only 25 miles long and the small little vineyard of the Chardonnay called Montrachet sits on the top of the hillside. This white is rich, full bodied and perfectly balanced with fruit and acidity and will hold up to the Shepards Pie. Thank you Terry for providing us with the perfect picks for a royal wedding celebration. Your choices are certainly fit for a Prince and Princess! This entry posted in food and drink, wine. Entry Tags: Royal Wedding Bookmark the permalink. Have you picked out your hat yet? What a fabulous quote! Must have a bottle on hand on the 29th! Lovely and informative, as usual. Never considered champagne at 8:00 am until this moment! Why not? Loved that quote. Such a glamorous and special history lesson. Royals and champagne and tradition!! Love this. That was fascinating. It’s amazing how much damage a foreign insect can do. That must have been devastating to the farmers when Phylloxera came over from the US. The whole world is facing incidences like this over and over.. We will turn into another Pangea I suppose, except we will be disconnected by water. Instead we will share the same insects, plants, animals…those that can survive. Take care! I was thinking that a mimosa was the right way to go since the wedding is so early. Now, I’m thinking Bollinger! Love Lily’s quote….that’s pretty much how I feel about champagne!! 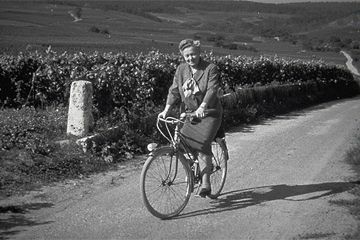 I was so glad you featured that champagne – I had a bottle of their rose and saw the quote on the bottle and new it was a woman after my own heart. I have that quote in my book. I will drink Champagne on a Monday, Tuesday or Sunday no special occassion for me. I might have to buy a bottle for the Royal Wedding. Cheers to another great Wine Wednesday. Love the quote. would like to adopt that as my own mantra. I love this series. will definitely try this champagne. 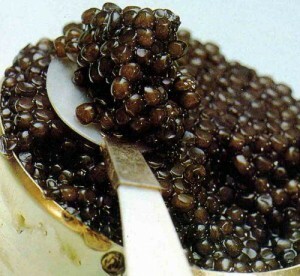 Am looking forward to a royal brunch on the 29th in honor of the wedding given by one of our clients and new friends.. This would be a great gift to take. Yum. I would ask for that cottage pie too. 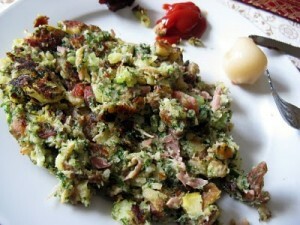 I would love to make that. I haven’t had a Shepherd’s pie in so long. 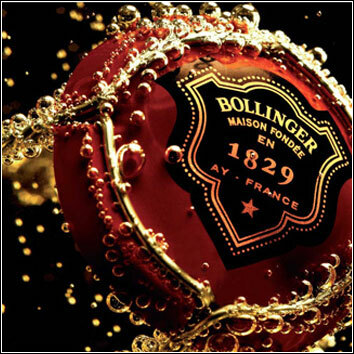 Bollinger will be the perfect royal wedding day celebration drink…cheers!! Wonderful post as we count down to the big day. I will definitely toast the royal newlyweds with a glass of champagne! Bollinger is certainly a terrific bottle of bubbles, but Decanter Magazine claims Wils & Kate will be serving Pol Roger at their wedding instead. Pol also has a long history in Britain, as it was Sir Winston Churchill who championed the brand & was reported to have consumed ridiculous quantities of it. 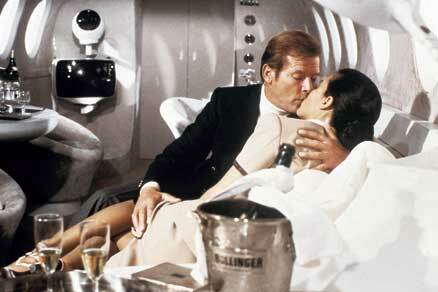 He named his racehorse Pol Roger & was rumored to have had quite the affair with Odette Pol Roger. Yes I read that and posted on facebook about it! Interesting history!! 82 queries in 1.296 seconds.